What Happens When a Hermit Crab Dies? Hermit crabs can be shy and unsocial. They can have molting periods where they shed their exoskeleton, making them look strange and immobile for months. It can be hard to tell if a hermit crab is dead, stressed, molting or just shy. There are some things that happen to a hermit crab when it dies that help make that determination. It is not unusual for a hermit crab to lose a leg or even a claw when under duress. This can happen shortly after acquiring the crab as it deals with the stress of yet another environment. Hermit crabs are shipped from their home environment to a distributor, then to a pet store or other place where the buyer acquires it, then placed in another habitat in its forever home. This is a lot of stress on a small animal. Losing one leg or even a claw is not a death knell for the crab. If your crab is losing more than one leg in a 24 hour period, this can mean it is in trouble. Isolate the crab and keep it as comfortable as possible. Molting crabs dig into the sand to bury themselves for up to three months' time. Their exoskeletons are shed, leaving them looking milky white. It is best not to disturb a crab when molting. If you question whether the crab is dead or molting, flatten out the sand around the crab without digging up the crab. Check the smoothed sand for evidence the crab came out for a drink or food when unobserved. The best indicator of whether or not a crab is dead is the smell test. A dead crab will have a strong smell. This smell is described as a fishy to truly rancid smell. If the smell of your crab is repellant, it is a good indicator your crab may be dead. Molting crabs will have a white exoskeleton. This is not a sign of a dead crab. Healthy crabs that are not molting are pink or red. If your crab looks gray, it could be a sign it is dead. Check for movement or smell. A dead crab will become rigid and loose in its shell. If you shake the shell, the crab will fall out. If you suspect your hermit crab is dead, give the shell a shake to see if the crab falls out. 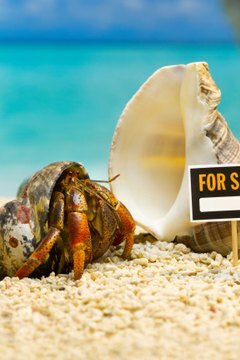 The Hermit Crab: Is My Hermit Crab Dead?